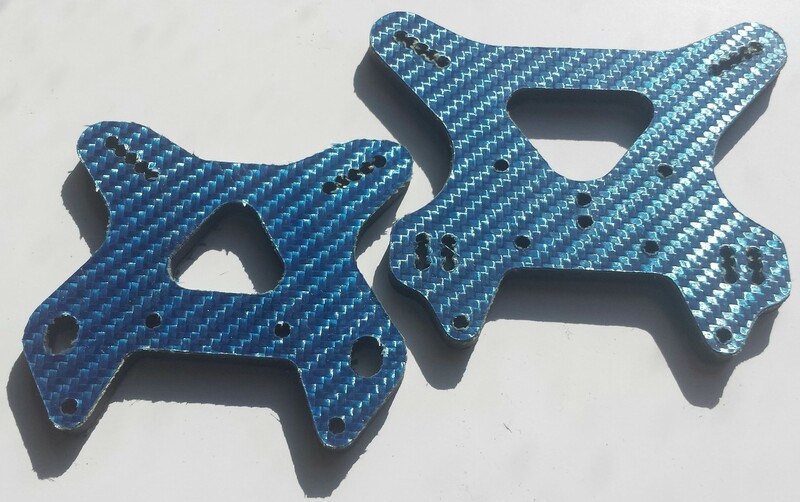 We have developed a Super Hybrid Composite, includes True Blue Carbon Fiber over Kevlar with a carbon fiber core. We have developed this shock tower to not only be awesome looking but be structurally stronger and more durable than any other shock tower material on the market using our special conmposit carbon fiber kevlar core. Due to the nature of Kevlar some edges may have kevlar fibers. it is recomended to seal all edges with CA Glue and sand lightly to finish the edges smooth, and apply a final CA coat on the enges for a nice smooth finished edges. it is recomended to use a Q-tip amd dip it in CA glue and apply. Warranty Subject to availability or stock on hand. Does not include normal wear and tear.